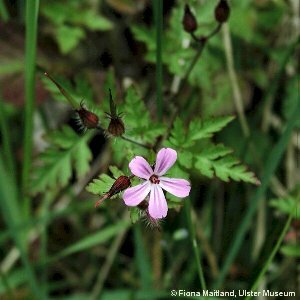 Herb Robert is one of the commonest of our native annual wild plants in a wide variety of habitats, but especially in shaded hedge banks, woodland, on walls, seaside shingle banks and on rock faces. 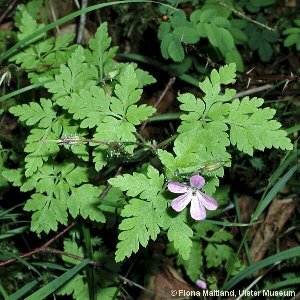 It is easily recognised by its small pinkish-purple flowers and the characteristic fern-like leaves. The stems are usually dark red, with swollen nodes, normally lying horizontally on the ground, but sometimes clambering up through other plants. The closely-related G. purpureum (Little Robin) does not occur in Northern Ireland. 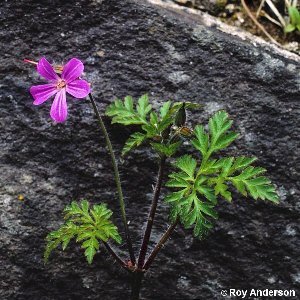 All names: Geranium robertianum L.